For many parents, middle school is when schooling begins to get serious or intimidating. That’s why some families who have homeschooled elementary school begin sending their students to brick and mortar schools or why prospective families are hesitant to take the plunge. However, it’s actually the perfect time to homeschool and there’s no need to be intimidated. 1. Middle schoolers are experiencing incredible brain growth. Think about how much your toddler changed over the course of a short few years. For a little while, brain growth slows down as kids integrate the growth and changes, but it begins to kick back up in middle school. It’s a good time to get to know the person your middle schooler is becoming and to really be a part of shaping your child through that growth in a way that homeschooling can make easier. 2. It’s genuinely an uneven, spacey time of life for kids. 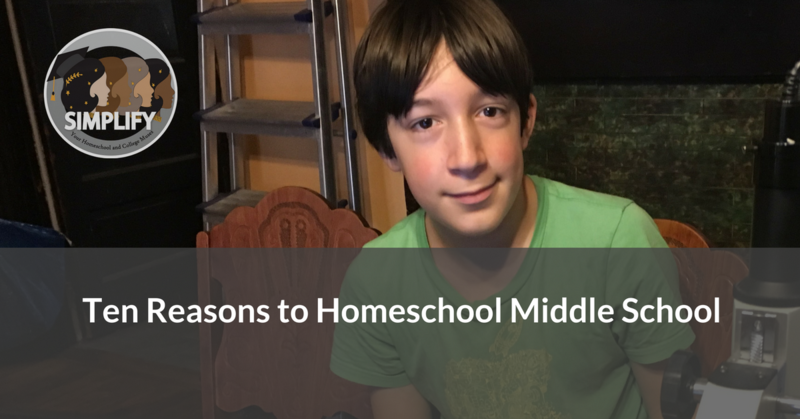 One of the reasons parents often feel like homeschooling their middle schooler will be too hard is that middle school can be a tricky time for many kids. They often struggle to find an even keel and go from brilliant one day to forgetting how to add two plus two the next. The thing is, school doesn’t fix any of that and with the one size fits all mentality, it may exacerbate it. Only growing up will permanently solve those issues. In the meantime, having a personalized approach with a little flexibility can be more important at this age than any other. 3. Middle school studies tend to be in a holding pattern. Because of all those uneven kids, middle school academics used to ground to a near halt. It became a time to solidify and practice skills already introduced in elementary school. Initiatives like Common Core have changed this somewhat, but just at the time when kids need to delve into deeper thinking, they’re often stuck with more rote learning and review. 4. If they’re not a holding pattern, they tend to have a lot of false rigor. But wait, some readers may be saying, my local middle school seems to have so much going on academically! Some of that may be good, but take it from this former middle school teacher: a lot of it just looks great on paper and isn’t deep development of skills as much as showy projects or things that sound great, but involve a lot of teacher or parent help instead of student learning. 5. Middle school homework is out of control. Speaking of false rigor, a lot of that false rigor comes in the form of extremely large homework loads. Some of it will sound amazing. They’re reading so many books and doing so many math problems! However, studies have shown time and again that homework still doesn’t make a measurable difference on test scores at this age. All that homework isn’t for significant gains in learning. When you consider how damaging it can be for your family time and your child’s free time and anxiety levels, it seems especially hard to justify. With homeschooling, you can target the work that your child really needs. 6. Middle school puts organizational demands on kids that they’re often not ready for. This is an age when kids feel the need for more independence, but they’re often not ready to manage changing classrooms all day and keeping track of things for a full slate of teachers and classes, including assignments that have multiple steps, at least not without a lot more support than most schools provide. They’ll get there, but middle school often throws kids into the deep end too fast, just at the time when their brains are already overwhelmed as they grow. With homeschooling, you can slowly build up to that type of independence without the massive drop off. 7. Middle school is bullying central. Bullying can happen at any age and in situations outside of school, but it usually reaches its peak in middle schools, where kids are experiencing early adolescence coupled with a new independence in how schools are structured. Even good schools can struggle to cope with bullying at this stage and kids often feel most vulnerable and unsure of themselves at this age. 8. Middle schools may just not be an idea that works. Recent studies are starting to show that putting a large group of kids with the same age challenges in one building and adding the stress of changing that many classes just isn’t good for them. When compared with students in K-8 schools from the same population, middle school student scores in reading and math dropped or flatlined while middle school aged students at K-8 schools saw scores rise. It’s just not a winning model for kids. 9. Middle school academics aren’t harder to teach than elementary school ones. There’s a sense among parents that middle school, especially “these days”, is too hard to teach because the level of information is too difficult. I think this goes back to the problem with false rigor where schools make it sound like kids are learning science worthy of graduate students. They’re still kids. None of it is too difficult to teach. It’s okay to learn alongside your kids if you need to, especially at this level. You also have to remember that none of this is going on a transcript yet. Plus, high school content subjects like history and science start from the beginning. Having background knowledge helps, but you can’t miss some critical piece of information. You may feel a need keep up with math and writing, but you absolutely can teach those things. They’re not as complex as schools try to make them sound. 10. Middle school is the perfect time for outside the box learning. If you can look past all that spaciness, radical brain growth, and emotional volatility, middle school is a really magic time. Kids are old enough to start asking bigger, deeper questions. They are bursting with creativity. They’re just starting to explore the world in a more meaningful way. It’s the perfect time to capitalize on that and there’s no better way to do it than with creative, outside the box thinking programs, deep discussions at the kitchen table, flexible time for rabbit trails, and plenty of room for personal projects like art or coding or athletics. It’s a time to nurture and creative passions and to keep a little magic in kids’ lives. Homeschooling can do that in ways that school often can’t.